Probably like, my simplest submarine. It has a nice layout, so people like it alot. Here's the old post, for anyone wanting the older submarines or something idk. Thought it might be worth uploading all of my subs, primarily because I modify them frequently and, when joining other servers that have the subs, they tend to all be horrendously outdated. Made this in literally ten minutes. I plan to attach it to a bigger submarine as an assault vessel, but until then it serves a small two-person submarine. My 10th submarine. SS Maia - Non-Nuclear submarine. This is a pretty mundane submarine, nothing special about the outside; The only interesting thing about it is the Battery Core, which allows for fine manipulation of things such as the output level of the battery arrays. It is pretty much a test submarine for that feature, but nevertheless it works well and I like it enough to keep it in rotation. My 9th submarine. Made entirely with unique design in mind. I wanted something nice and open with more of a vertical approach, and in that front I succeeded. It's a little under-armed, and despite being rather small the openness of the centre gives the impression of it being large, and so when playing it with low pop people seem to complain it's too large. My 3rd submarine. Another non-generic generic submarine with much the same purpose. This one plays with how corridors and stairs work, with nothing being 'levelled' as it should be. A little hard to navigate considering the (intentional) seperation between the front and back half by the (another unique feature) central ballast, but it does well on the fighting part, providing the players can manage to keep the guns loaded. My 8th submarine. Luxury Liner - Roleplay vessel. Roleplay vessel, simple as that. It's somewhat resilient in terms of combat, but it's firepower is severely lacking, and so I don't recommend use on standard missions. SS Odyssey - 'proper' submarine. My personal favourite. Made after the Mk II, and Mk X, it too was made to be tanky. The sections again separate themselves when one becomes flooded, however in this submarine the flood doors can be overrided. Much like the Mk II, it has a maintenance shaft connecting the sections together. This submarine's sections are also entirely independent if the 'grid' junction boxes are disconnected. All sections have 6 pumps and batteries. It also provides a large amount of information (while avoiding the oh-so-common unnecessary habit of including things like oxygen levels which serve virtually no purpose as there's absolutely nothing you can do with that information aside from realising that you really should get power back on) such as a battle stations button, compacted water leak warnings, reactor heat indicators, medivac requests, alert levels, etc. Another neat feature which most people seem to overlook is placing windows where the guns can fire, as fish have a tendency to aim for the windows. My 7th submarine. SS Odyssey Mk II - A tank in sub form. A tank in sub form sums it up perfectly. It's made to be resilient, that was my only purpose behind it. I've never, ever seen it entirely flooded. The sections separate from eachother when one becomes flooded, each with it's own automatic bilge pump and ballast. Every section is on a separate grid from the reactor, and so will not suffer in the case of a reactor overload (unless engineers leave the breaker switches on) it also has a maintenance shaft at the bottom, connecting the sections when they are separated by flood doors while also acting as a second hull. Due to the sheer size of the submarine, it's virtually impossible to sink the submarine with any less than 3 leaks. (Unless the power is off). My 5th submarine. Title says it all. 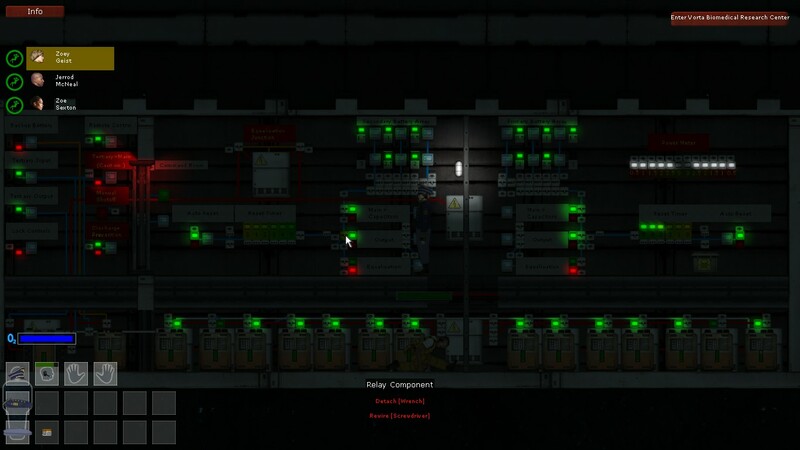 It's a mobile battery box, just like the Maia. SS Atlas - A light attack shuttle. Made to accompany the SS Odyssey, however should fit onto any other submarine without any problem. Intentionally has hard to reload cannons and low battery life so that it has to return to the Odyssey frequently. SS Atilla - A docking-only respawn shuttle. Designed more for anti-grief than any other reason. Hatch can only be opened once docked, has two hatches to make any hack attempts noticeable. Has a captains quarters style thing with all the controls and a door lock, so that if the shuttle rams into the main sub you can usually blame the person who was sitting in there rather than just guessing. Diving suits locked away in the back, captain opens it. Comes with basic repair gear in the locker, 4x masks, 8x oxygen tanks, 4x welding tools, 4x welding fuel tanks, 4x flashlights, 4x batteries. A real simple, small escape shuttle. Only has an undock button, as it's not meant to return. Batteries come uncharged, meaning the shuttle needs to be prepared before launch. There's also a flipped version for attaching to the rear of a sub. 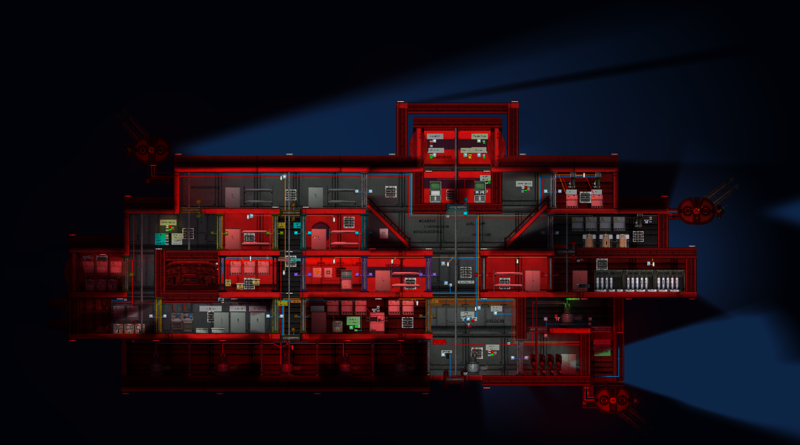 The maximum output is 8kw, but if you're using this you should probably also have a system for saving power by turning off rooms when not in use, which should be able to save atleast 2kw in a 10kw submarine, so it should be able to power a sub the same size as a single reactor can do. The wifi signals used are 2-22, and multiples of 5 up to 60. (So 25, 30, 35, ... 60) Be sure not to overlap. I've tried to avoid generic-purpose subs. All the subs had a distinct design goal in mind before making them (aside from the Rhea) and all of them are somewhat aesthetically pleasing, or atleast they're not floating boxes and all have something that passes for organised wiring. 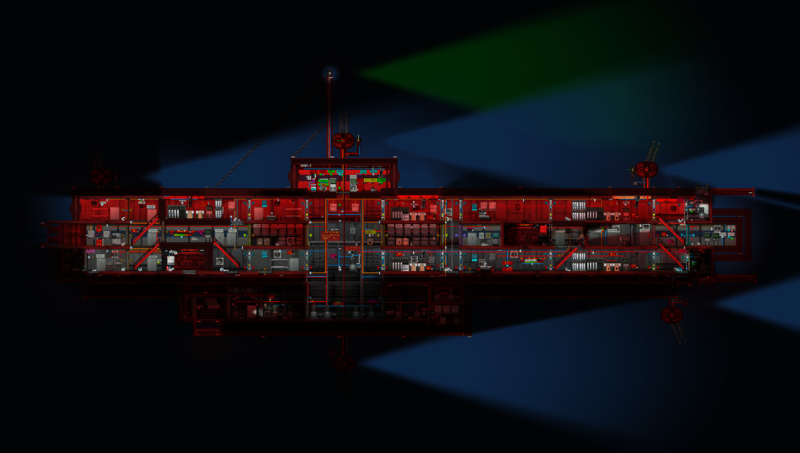 There's also 2 subs not included; My first sub (the SS Titan) which although I personally liked, the main hallway was a T shape with a single, long ladder that people got rather frustrated at when they got knocked off. Also my fourth sub, the first variant of the SS Odyssey, which simply does not compare to the other two and so was deemed a failed project and scrapped. -More wiring fixes. Complicated wiring = many problems to fix. -Fixed a large variety of issues on all subs, in particular SS Odyssey and Luxury Liner. -All subs excluding SS Rhea, SS Scylla and SS Hades given escape shuttles. -Added SS Atlas, an attack shuttle. -Put a picture of Osirus in it's description. -SS Scylla-Added emergency buttons to close of windowed compartments. Reduced battery charge. -SS Maia-Reduced battery charge. Added drainage bypass from lower hallway to ballasts. Fixed wiring issues. -SS Rhea-Cluttered lighting has been fixed. -Luxury Liner-Fixed BG, made a little more survivable. -SS Odyssey-Variety of tweaks and fixes. Looks a little neater. 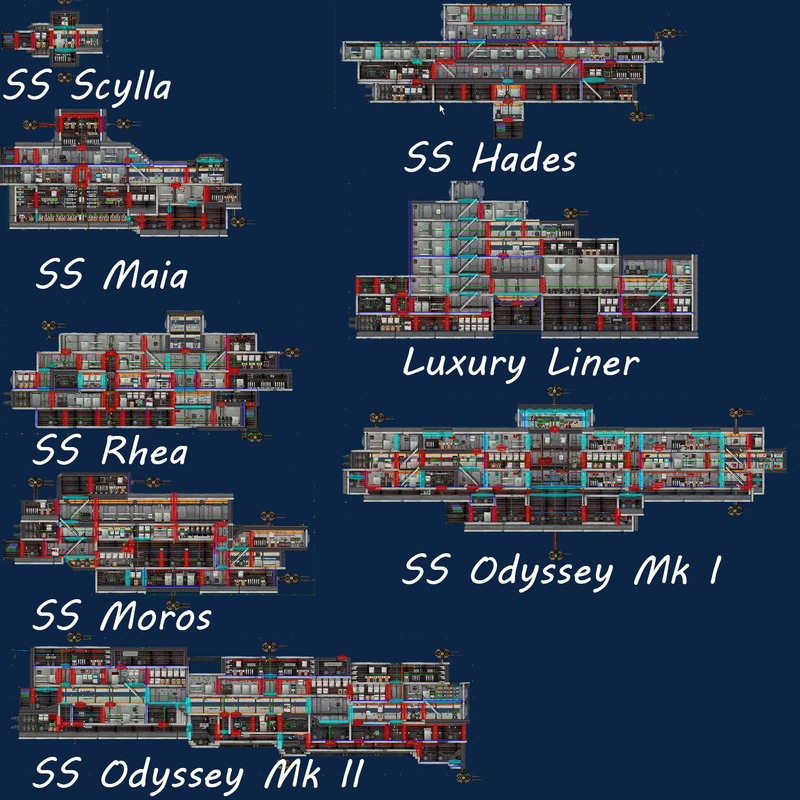 -SS Odyssey II-Added more loaded content to closets. -Added in all the subs. Last edited by Esoudiere on Mon Aug 27, 2018 6:34 am, edited 15 times in total. 10/10 would use all of these subs again. Probably going to stop making more submarines for a while now. I made most of the submarines to explore the more abstract mechanics of the game, and now I feel I've explored just about everything that I can. I'll continue to update them whenever the game updates, but probably won't make anymore until there is a major change that warrants an entirely new submarine. 11 submarines, 3 shuttles - I'm happy with that number. - The right guns and the center guns have no air supply. - One of the ammo storage of the right guns is empty. You can get shells from the other ammo storage, but it's annoying due to the auto-doors. - The reactor floods easily, the automatic door there doesn't seem to open automatically when it's flooded? - Damage to the pump rooms on the underside can only be repaired from the outside of ship. As the ship will usually be sinking or on the bottom when they need repairs, this is quite impractical. Certh wrote: - The right guns and the center guns have no air supply. Really? Sorry, I haven't actually done anything to any of these subs for like, 3 months, nor have I played on them during that time. There should be no reason why the guns run out of oxygen, there's nothing blocking the flow. I'll add extra vents and up the oxygen production, however. Certh wrote: - One of the ammo storage of the right guns is empty. You can get shells from the other ammo storage, but it's annoying due to the auto-doors. Auto-doors? I just hopped on and tested it, they're working as normal: Open unless there's water. True, though, that the ammo storage is empty. I am embarrassed, for I have not noticed that before. Certh wrote: - The reactor floods easily, the automatic door there doesn't seem to open automatically when it's flooded? Again, tested it, it works fine. If someone has manually opened the door from the bridge, the auto-door feature is turned off. The reactor should also be closed by the captain once the power is set up. 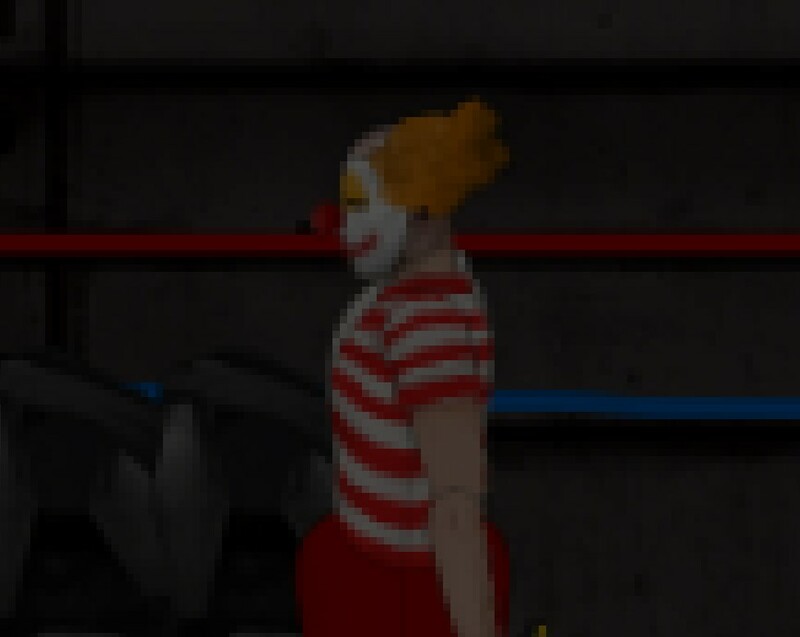 It was made back when ragdolls could fit under there. I'm kind of waiting and hoping that prone is added. The submarine is kinda designed to be able to float with that lower section flooded, so I don't want to make it any bigger. Disable the breaker switches if power starts failing. That limits the amount of electricity provided to the three sections to what their intended consumption should be, which fits inside the limitations of 10,000w. This and the other issue is one and the same, no? Thanks for the feedback, though. I was quite disheartened when no one cared to give me feedback. These will no longer be updated. Can you tell us why you named your ships after Hitlers dreaded Nazi organization that enforced the racial policy of the 3rd Reich?